Captain John English was born in England ca. 1599. He married Frances in England ca. 1624. He arrived in Virginia prior to 1655 and he was a member of the Virginia House of Burgess in 1659. His will was proved in Isle of Wight County, Virginia 09 October 1678. Captain John English is a qualifying member for the Jamestowne Society. Sarah Watts, daughter of Captain John English and Alice, married Henry Pope of Isle of Wight County, Virginia whose will was proved 28 October 1728. Jacob Pope, Sr., son of Henry Pope and Sarah was born before 1728, Isle of Wight County, Virginia and died after 1743 intestate, Edgecombe County, North Carolina. His wife was Tabitha. Jacob Pope, Sr. had a land grant dated 12 June 1730 on Swift Creek next to his brother William Pope who had a land grant also dated 12 June 1730. Jacob Pope, Jr., son of Henry Pope and Tabitha had a will that was proved in Edgecombe County, North Carolina May 1772. His wife was Jane. Jacob Pope, Sr., and Jacob Pope, Jr. had many land transactions that involved land on Swift Creek, north of the Tar River. Mourning Pope, daughter of Jacob Pope, Jr. and Tabitha married Jeremiah Hilliard, Jr. Jeremiah Hilliard, Jr. died intestate before 1742 in Edgecombe County, North Carolina. Mourning Pope married 2) after 1742 Joseph Thomas, 3) about 1760 William Pridgen, Sr., 4) after 1762 George Wimberly, Sr., all of Edgecombe County. Mary Hilliard, daughter of Jeremiah Hilliard and Mourning, was born 1749 Edgecombe County, North Carolina and married Rev. Jonathan Thomas born 1735 son of Rev. John Thomas, Esquire (DAR and SAR) and Christenator Roberts of Edgecombe County. Teresa Thomas, daughter of Rev. Jonathan Thomas and Mary, was born after 1756, Edgecombe County, North Carolina and died before 1802. She married Moses Rountree of Edgecombe County. Moses Rountree died intestate April 1804 Edgecombe County. Moses married 2) unknown, 3) Priscilla (?White). Moses and Teresa had Sally (Sarah), Mary Polly, Elizabeth, Lewis, Willie, and Teresa. Moses and unknown had no known living children. Moses and Priscilla had Nathan, John and Benagy who were minors in 1804. Mary Polly Rountree, daughter of Moses and Teresa was born between 1774-1784 in Edgecombe County, North Carolina. She married about 1800 Stephen Tomlinson of Dobbs/Wayne County, North Carolina. Stephen Tomlinson and Mary Rountree lived near the Great Cabin Branch (present day Cedar Branch) north of present day Blalock Road in Wilson County, North Carolina. Jonathan Tomlinson, son of Stephen Tomlinson and Mary Rountree, was born 26 August 1801 Wayne County, North Carolina just over the Edgecombe County line, and died 02 March 1873. He married Priscilla Rentfrow who was born 1806 and who died 21 September 1866. Stephen Tomlinson sold Jonathan Tomlinson land on the Long Branch. Jonathan and Priscilla are buried in the Tomlinson Cemetery on Lely Road, Wilson County, North Carolina. Elefair Tomlinson, daughter of Jonathan Tomlinson and Mary Rountree, was born 03 December 1827, Wayne County, North Carolina. She married James Daniel, who was born 09 December 1825, Wayne County. Elefair died 03 May 1900, and James died 19 December 1902. James and Elefair are buried in the J. Daniel Cemetery, located at Old Black Creek Road and Frank Price Road in Wilson County. Priscilla Daniel, daughter of James Daniel and Elefair, was born 31 October 1859, Wilson County, North Carolina. She died 01 January 1888. Priscilla married Nathan Bass (his first) 01 January 1888. Nathan Bass was born 11 May 1851, and died 19 April 1926. Nathan and Priscilla are buried in the Nathan Bass Cemetery, Alton Road, Wilson County, North Carolina. Nathan Bass married 2) Nancy Howell in 1895, and 3) Patsy Barnes in 1906. Nathan Bass was a member of the North Carolina Legislature, and was a large land owner in Wilson County. Sallie Bass, daughter of Nathan Bass and Priscilla, was born 15 January 1885, and died 31 October 1949. She married Malachi Daniel Lucas 09 May 1907. M. D. Lucas was born 12 March 1884, and died 14 July 1909. Sallie Bass married 2) James Hendricks Thompson 16 February 1913. Sallie Bass Lucas Thompson is buried in Maplewood Cemetery, Wilson, North Carolina. M. D. Lucas is buried in the Silas Lucas Cemetery, Lucama, North Carolina. 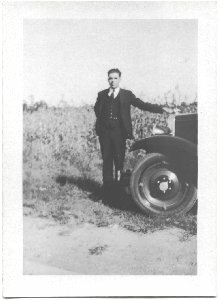 Charles Clement Lucas, Sr., son of M. D. Lucas, and Sallie, was born 11 March 1908 and died 01 November 1989. He married Sallie Elizabeth Williams 25 December 1937 of Sampson County, North Carolina. She was born 01 April 1911, and died 19 August 1997. Charles Clement and Sallie are buried in Maplewood Cemetery, Wilson, North Carolina.